One of the more unusual tourist attractions in Austin, is the nightly flight of millions of Mexican free-tailed bats emerging from their roosts under the Congress Avenue Bridge. The bridge was revamped in the 1980s and regularly-spaced crevices underneath the new structure inadvertently created a perfect resting spot for thousands of bats. The bat colony takes up residence under the bridge in mid-March each year and returns to Mexico in early November. There can be up to 1.5 million bats living under the bridge at the height of bat season. During their sojourn in Austin visitors are amazed by their mass evening emergence from their roost, which generally takes place at dusk. 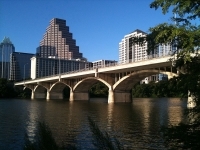 The Congress Avenue Bridge is 10 blocks south of the State Capitol building, spanning Town Lake. A Bat Observation Center is located on the southeast side. During bat season hundreds of people gather on and around the bridge each evening to witness the spectacle.